McLaren’s 570GT gets its own B&W sound system | What Hi-Fi? If you’re lucky enough to be able to afford the newest member of McLaren’s Sports Series of supercars, you’ll have the option of equipping it with a Bowers & Wilkins sound system. McLaren’s 570GT will have its first public outing at the Geneva Motor show, which kicks off on the 3rd March. 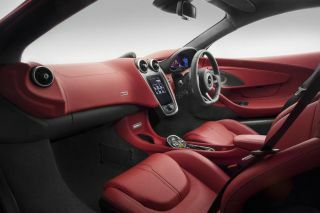 The car comes fitted with McLaren’s eight-speaker Audio Plus system as standard, but chances are buyers are going to tick the box for the Bowers & Wilkins Audio System, a 12-speaker set-up that’s been specially tuned for the car’s interior. Five aluminium Nautilus tweeters work together with five Kevlar midrange drivers and a couple of 20cm subwoofers. The system is driven by a 14-channel, 1280W digital amplifier. The 570GT is the latest car in McLaren’s Sports Series to offer a B&W sound system. The two brands first teamed up back in April 2015 when the range was launched with the 540S. Since its debut, the line-up has also seen the arival of a 570s and now the GT version, all of which offer a B&W upgrade. It’s not a new concept for audio brands to team up with automotive manufacturers, of course, with Bang & Olufsen, Burmester, Naim, Meridian all having a presence on four-wheels. McLaren has kitted out the 570GT with special noise-cancelling tyres - Pirelli’s Noise Cancelling System (PNCS) is a new technology which is claimed to reduce road noise from the grooves in the tyre and to absorb vibrations, preventing them from transmitting to the cabin (and spoiling the sound from your B&W system in the process). Pricing for the optional B&W system is yet to be confirmed, but if you can afford the £154,000 starting price for a 570GT, the extra cash required is unlikely to be a huge concern.